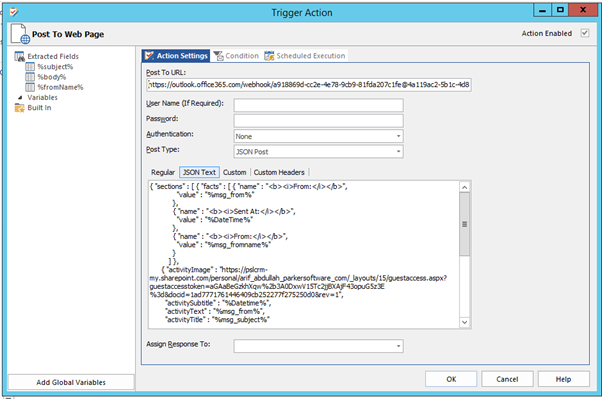 In the trigger actions, use the post to web page trigger to post JSON Data to Teams. Post to web settings. If necessary, use http://jsonformat.com/#jsondataurllabel to evaluate and check your JSon. Let’s start with a simple test to verify functionality. Replace the value for the URI string in the following script and test it by running it in PowerShell ISE. 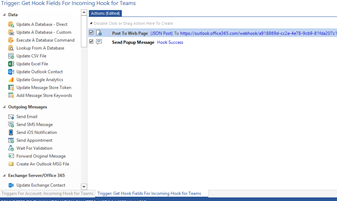 You should see a “1” returned in the PowerShell window and new post in the Teams channel. If an error occurs, it will appear as an error in PowerShell communicating a malformed web service call. text = "A build completed with status $status"